Flow cytometric staining of bovine peripheral blood monocytes. A. 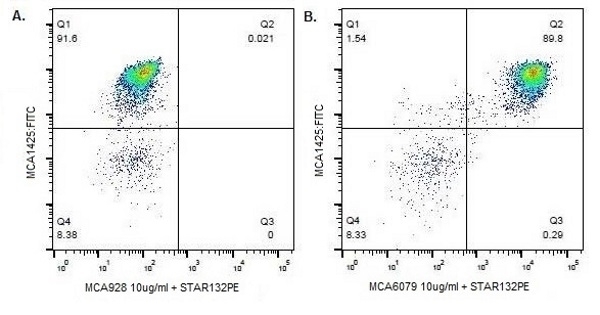 Mouse IgG1 negative control (MCA928) followed by Goat anti Mouse IgG1:PE (STAR132PE). B. Mouse anti Bovine CD172a antibody, clone DH59B (MCA6079) followed by Goat anti Mouse IgG1:PE secondary antibody (STAR132PE). Both the Mouse IgG1 negative control and Mouse anti Bovine CD172a are plotted against bovine CD11b as recognized by FITC conjugated Mouse anti Bovine CD11b antibody, clone CC126 (MCA1425F). Mouse anti Bovine CD172a, clone DH59B, recognizes bovine CD172a also known as SIRP alpha or MyD-1 antigen. CD172a is a transmembrane signal regulatory protein expressed primarily by macrophages, monocytes, dendritic cells, granulocytes, myeloid progenitors, hematopoietic stem cells, and neurons (Barclay et al. 2006). The extracellular region of SIRP family consists of three immunoglobulin superfamily (IgSF) domains; two IgC and one IgV domain (Barclay et al. 2006). The IgV domain of CD172a binds to CD47 (Hatherley et al. 2007).The binding domain of CD172a is analogous to that of immunoglobulins and T cell receptors and is involved in myeloid cell activation (Berg et al.2004). However, signaling via CD172a is mainly inhibitory to cell function and phagocytosis (Oldenborg et al. 2001). CD172a expressing cells are stimulated in Mycobacterium tuberculosis infection, influencing migration of dendritic cells and macrophages, phagocytosis, and granuloma formation (Waters et al. 2009). Herrmann L.M. et al. (2003) CD21-positive follicular dendritic cells: A possible source of PrPSc in lymph node macrophages of scrapie-infected sheep. Davis W.C. et al. (2007) Use of flow cytometry to identify monoclonal antibodies that recognize conserved epitopes on orthologous leukocyte differentiation antigens in goats, llamas, and rabbits. Vet Immunol Immunopathol. 119 (1-2): 123-30. Ibrahim S. et al. (2007) Screening of anti-human leukocyte monoclonal antibodies for reactivity with equine leukocytes. Vet Immunol Immunopathol. 119 (1-2): 63-80. Mérant C. et al. (2009) Young foal and adult horse monocyte-derived dendritic cells differ by their degree of phenotypic maturity. Vet Immunol Immunopathol. 131 (1-2): 1-8. Contreras G.A. et al. (2010) Lipomobilization in periparturient dairy cows influences the composition of plasma nonesterified fatty acids and leukocyte phospholipid fatty acids. J Dairy Sci. 93 (6): 2508-16. Herrmann-Hoesing L.M. et al. (2010) Ovine progressive pneumonia virus capsid antigen as found in CD163- and CD172a-positive alveolar macrophages of persistently infected sheep. Vet Pathol. 47 (3): 518-28.